we present the high end plano milling machine in the national as well as international market. Our double column milling machines are available with rigid box type construction ram head. In addition to this we also deal in heavy duty single column milling machines. In addition to this, we are a major plano milling machine supplier in the industry. the precitec ram type plano-milling head is of state of art design with provision for full features available on latest plano-millers globally. It will be provided with rigid box type construction ram head. This will be provided with lm profile guideways for the up/down movement. Also ball-screw-nut will be provided for the movement of the ram axis. The ram will have house the robust cartridge type spindle. The spindle will be iso-50 nose. It will be supported on high precision preloaded angular contact bearings of sufficiently large diameter bore. The spindle will be of maintenance free construction with grease lubrication for life. The spindle can be operated upto 3000 rpm thus providing a very good speed range which will be suitable for wide range of application. The spindle will be provided with an well designed two speed gearbox which equals it. The lower range will be suitable for face milling while the higher speed range will be suitable for the end milling, profiling, drilling, and used of latest hispeed tooling. The spindle motor provided will be standard ac motor and the speed will be infinitely variable through the inverter drive provided. The spindle will also be provided with an power draw bar mechanism which is actuated either pneumatically or hydraulically. The spindle will also have a facility for through coolant for using in latest tools. Also the spindle can be used for vertical deep hole drilling activities which is required commonly in heavy engineering industries. Thus the spindle will be suitable for various activities like milling, boring, drilling, profiling, end milling, trepanning, u-drilling, tapping, gun drilling etc. For the spindle feed (ram –axis) a feed system will be provided with a single axis cnc from indramat/ equivalent.(optional). The main advantage of such a system is that we will be providing a encoder feed back from the spindle and provide controlled feeds which will be suitable for tapping, thread cutting, boring etc. Also the depth control for the milling/drilling/boring operations can be done very accurately using the cnc controls. Infeed can be even given in steps of 10 microns making the whole system very versatile. The head will also be provided with an hydraulic counter balance system. This will help the head to operate in a very smooth way and counterbalance the vertical head weight. Also the head will have (optional) automatic speed range selector for high/low which will be actuated hydraulically. This head is offered as a complete package including the new saddle type carriage to suit your existing plano-miller cross rail. precitec plano-milling head ump i-7.5 and ump 5 has iso-40 spindle nose and a quill type spindle. The spindle will have 100 mm quill movement with fine feed [0.05 mm least count] and coarse feed facility. The spindle and quill will be of case hardened steel, 55-60 hrc case hardened. The quill will slide in a rigid quill housing of high grade [grade 25/30] cast iron. The bore in which quill slides will be precision bored and lapped to highest accuracy for smooth movement of the quill. The spindle will have hardened and ground splines for drive assuring long life under heavy cutting loads. The basic difference between the two versions of the head is in the drive from the motor to the gear box. this is our milling head with gear box specially designed for motors with operation with infinitely variable speed control for the motor from an sensorless vector drive. The gears are all housed in a rigid housing. All the gears will be case hardened and ground to class 6/7 (as per din std.). milling head with this gear box is most suitable when we have to frequently change the cutter and hence the spindle speed. Another advantage of this head is reduced overhang of the motor from the spindle center when compared to heads with change gear system. this is the standard version of the iso 40 milling head where in the speed change is achieved by means of change gears. The drive from the motor to spindle will be through a, proven, robust gear box which is specially designed for heavy milling loads. All the gears are hardened and ground and the head has its own lubrication pump. The change gears provide the option for change of speeds. The gear box housing will be of cast iron. It will be proper stress relieved and precision bored. This is head is ideal when the change of toolings is not necessitated very often and mostly face milling operation is carried out. The main feature is constant power availability at all speeds. note: the metal removal rate is purely indicative and only under suitable conditions. The actual values may vary depending upon job configuration, cutters/inserts used, machine condition, clamping arrangement for job and carriage on cross slide, coolant facility, etc. plano- milling head: we will be providing a plano-milling head with 20hp spindle motor. The head will have iso-50 spindle nose and will have a quill type spindle. The spindle will have 125 mm quill movement with fine feed [0.05 mm least count ] and coarse feed facility. The spindle and quill will be of case hardened steel, 55-60 hrc case hardened. The quill will slide in a rigid quill housing of high grade [grade 25/30] cast iron. The bore in which quill slides will be precision bored and lapped to highest accuracy for smooth movement of the quill. The spindle will have hardened and ground splines for drive assuring long life under heavy cutting loads. For the drive of the spindle from motor, we have three different options and we have quoted separately for each drive. Based on the convenience of usage, you can select any one of them. This is our standard milling head with gear box specially designed for heavy metal removal. The gears are all housed in a rigid cast iron housing. The gear box is provided with a special continuous lubrication pump for continuous lubrication of all the gears. 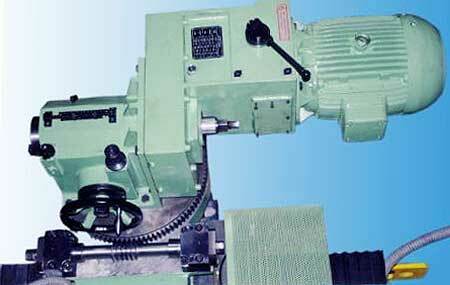 The gears will be of sufficient width and module to take heavy milling loads of face milling, slot milling etc. The gear box will be provided with a change gear system to get 6 speeds as specified. The speeds corresponding to different change gears are given on the chart, fixed on the gear box. This is a simple version and meets the requirements of plano-milling in most of the cases. The gear box provided will be a special gear box with a change lever with option for high / low speeds [2 speeds]. The spindle motor will be provided with an inverter drive. milling head with this gear box is most suitable when we have to frequently change the cutter and hence the spindle speed. The manual changing of change gears is avoided. Another advantage of this head is reduced overhang of the motor from the spindle center. Precitec offers various kinds of table drive unit suitable for plano-milling machine starting from a simple gearbox-motor reduction drive with fixed feed rate to servo drive arrangement for table drive. This is decided based on kind of machine, application and cost affordability. We have offered you model urdh 3 I this drive system will consist of following main components: with this arrangement you can have both planning and plano-milling operations being done on the machine. ac motor and gear box assembly: this will have an force cooled ac induction motor (7.5-hp-) of reputed make. This helps in proper heat dissipation when motor is working continuously at low rpm,s. The motor will drive the input shaft of a reduction gear box directly or through a slip free suitable timer belt drive provided based on the machine. output drive and clutch assembly: based on the machine and total reduction required at the output we will provide either a direct drive to the input shaft of the machine drive gearbox or provide an sprocket and chain drive. The driven sprocket/coupling will be mounted on the main drive input shaft on the planer. For this necessary changes/ modification on the input shaft will have to be done by the customer. If it is to be permanently converted into a plano-miller than we will remove the existing planer motor drive and provide drive from our reduction drive unit in lieu of the same. However if customer wants to retain the planning mode also for occasional planning than we will provide with an electro magnetic clutch (optional) on the input shaft of the planer. This has been offered separately. controls: complete control system for the plano-milling operations will be provided. The controls will include controls for spindle and table feed and necessary interlocks. all the required controls will be housed in a separate electrical cabinet placed on floor near to the place where reduction drive unit is fixed. All the elements used like mcb’s, contactors, cables etc for the control system will be of standard reputed makes easily available in india like siemens/ l&t/ technic/ indo kopp etc. sensor less vector drive will be provided for both spindle and table feed drive motor. The drives will be of reputed make like abb/danfoss/toshiba/control technique etc. The drives will have torque boost at lower rpm’s for steady performance. as standard all the control switches will be placed on the cabinet top itself and the cabinet will be specially shaped so that the top will be a inclined to form the operator console also. Optionally we can also provide a separate pendant box in which case the operators control will be housed in a pendant box which will be suspended from the top of the machine next to the control pendant for planer. We recommend this option as operator can stand and control themachine from either side. required controls for for/rev/stop rapid/feed selectors for table feed and similar start/stop and for/rev selector for spindle motor will be provided. The spindle rpm and table feed-rate will be adjustable easily using the potentiometer provided on the pendant of the machine. Also calibrated voltmeters giving the spindle and table feed rate will be provided on the pendant. Controls for selection of planer or plano-milling mode will also be provided. All necessary interlocks and required sensors/limit switches etc will be provided. This include interlock for operation of planer motor only when clutch of plano-milling is positively disengaged, table stroke limits, spindle rotation-table feed interlocks etc. complete required cabling material like cables, hoses, connectors etc for cabling from panel to pendant, motors, limit switches, clutch etc. as optional we can also provide ac servo induction motors and suitable drives for spindle and also for table drive on specific request as these provide better speed and feed range. In such a case the drive and motor will be of indramat/siemens/baldor etc. Based on customer preference. electro-magnetic clutch: we offered this as an option. This is recommended when planning is to be retained on the machine and very frequent interchanging between planning and plano-milling mode is required. Without this chain will have to be disengaged from the sprocket to operate in planning mode. We recommend strongly for taking this option for the ease of operation. during longitudinal milling operation it is recommended that the carriage on the cross slide on which the head is fixed be clamped. This will make possible to use head to its true potential as clearance in the carriage jib will be eliminated and thus provide very high rigidity for machining. Presently a manual clamping arrangement is provided on the machine. However this has to be loosened and tightened back every time the head is moved in the cross direction. Alternately we can provide a hydraulic clamping for the carriage so that it is automatically clamped when not being moved. This involves integration of the controls with the existing cross feed system on the machine. Also a separate airhydraulic clamping system with a hydraulic clamping cylinder for the head will be provided. Required hose arrangement for the cross movement of the clamping cylinder will also be provided by us. (required air connection/supply upto the airhydraulic intensifier to be provided by you). This is optional system we recommend considering you will have to frequently switch between milling in longitudinal direction and cross direction. This is a tilting arrangement recommended considering that the head will have to frequently tilted in either direction for making slots and beveling. Here a back plate with worm and gear arrangement will be provided so that the head can be easily tilted on the existing t-slot arrangement on the cross slide carriage of the machine. With this kind of arrangement head can be easily tilted by the operator himself very easily to required degree. Also the graduation provided on back plate for the angle of tilting will help in very quick setting for purposes like beveling etc. For providing this arrangement the back plate arrangement will be specially designed by us to suit the machine on which the head is being fitted. Spindle Nose ISO 50 with manual/power(optional) Draw Bar. Bearings High Precision Angular contact Bearings-Preloaded. Tool Clamping (optional) Through Pull-stud mechanism, Hydraulically/pneumatically operated. Spindle speed range selector Hydraulically operated. Provision for mounting Right angle and universal milling attachments., Trepanning, Gun drilling etc. Spindle Nose ISO 40 with manual Draw Bar. Max Spindle Speed [RPM] 1800. Feed Arrangement. [A] Fine Feed - 0.03 mm Least Count. Bearings Taper Roller Bearing at Front , Cylindrical Roller Bearing at Rear. Max Cutter Diameter. 160 mm. Recommended maximum 125 cutters for Rough Machining. Motor 7.5 HP, 4 Pole Flange Type AC Induction Motor-1500 rpm. Lubrication Oil bath and forced lubrication with inbuilt oil pump. Spindle Nose ISO 50 with manual Draw Bar . Max Cutter Diameter. 400 mm. Recommended maximum 315 cutterfor Rough Machining. Motor 20 HP, 4 Pole Flange Type AC Induction Motor-1500 rpm.